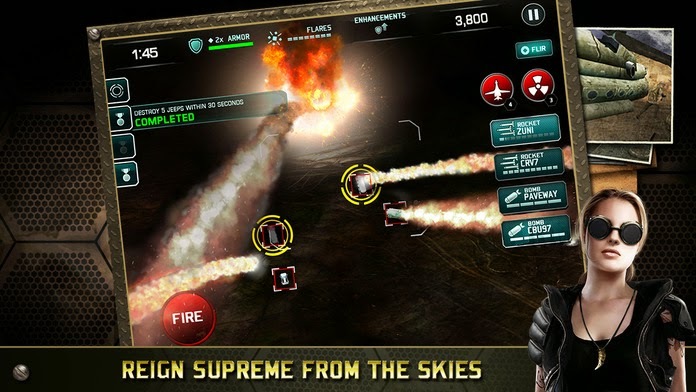 Reliance Games has announced Drone: Shadow Strike is set to arrive for iPhone, iPad, and iPod Touch this October. The game features around twenty elite missions, 270 challenges and four campaigns to keep players entertained for hours on end. Ready to learn more? Read on. Strike with precision in Drone: Shadow Strike, a new aerial action combat simulator from Reliance Games. Take out enemy ground forces with today’s most advanced unmanned aerial vehicles to turn the tide of war. The game will be available in October in the App Store for free for the iPhone, iPad and iPod Touch. Drone: Shadow Strike puts the player in command through the infrared lens of a special ops drone operator. The game features over twenty elite missions, 270 challenges, four campaigns inspired from today’s headlines and a complete arsenal of mini-guns, hellfire missiles and smart bombs at your disposal. To help defeat the onslaught of terrestrial enemies and surface to air missiles, choose from seven drones that are customizable to outfit a range of different combat scenarios. To learn more, visit the official Drone: Shadow Strike Facebook page. Want to see more content? Donate! If you would like to submit a sponsored post/ad for consideration, please learn more here. Tate Multimedia has released Steel Rats for PS4, Mac and PC. Read on to learn more. Double Fine has released Gang Beasts for consoles and PC. Read on. Wizard Entertainment has added four new events to their 2019 calendar. AT&T and Turner have announced the Hope Island Recovery Challenge for mobile game. BioGamer Girl© 2011-2019. All Rights Reserved.